The first Mimosa blossom in the garden. Returning from coffee in Fiano this morning, I ambled through the garden breathing in the air and absorbing the smell of spring just below the surface. Whilst the winter countryside and garden here in Tuscany is still very beautiful, thanks to the evergreen trees including the silver green of the olive, we still long for spring and the uplift of the mind that goes with it. 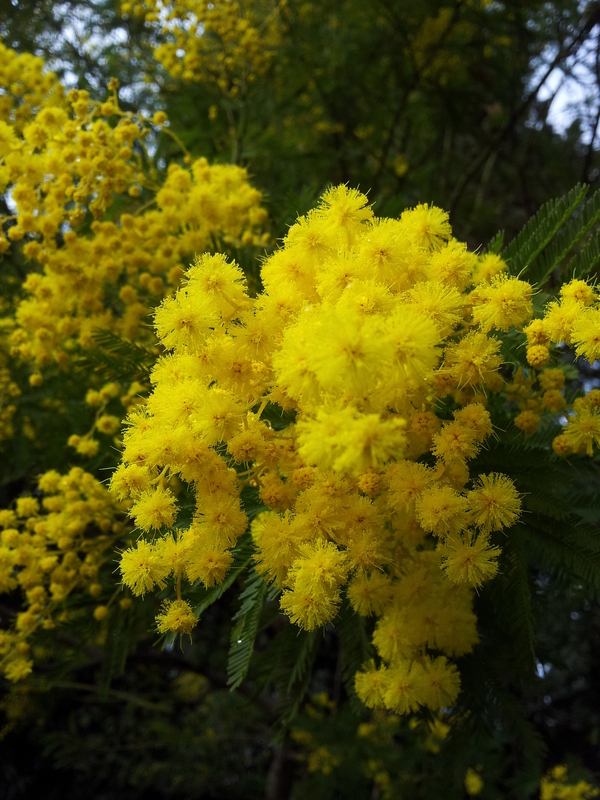 Then I saw the bright flash of yellow and, hurrah, the Mimosa tree has opened its first fluffy blossoms. So it will be only a matter of days before its heady perfume will be filling the air! The hugely popular and charismatic TV personality Carlo Conti joins me for coffee. Many of you will be aware that the 65th Festival della Canzone Italia has been going on in Sanremo, hosted by the very popular Carlo Conti. This is where the great and the good Italian singers go to celebrate, yes you got it, singing. There is massive coverage on television and the bar is full of talk about who they liked best the previous night. We do not have SKY where we are, and are limited to some local stations, BBC World, Bloomberg and a few obscure ones. So unfortunately, or depending on your point of view fortunately, we did not watch it. In my humble view, there are some very good Italian singers of popular music and a little rock, but there are also some awful ones that are amazingly popular and can be heard constantly on the radio. Radios are always playing in bars, hairdressers, dentists… Oh dio, why did I have to mention the dentist again! (I have one more visit to go, you see, so think of me on Tuesday!) Fortunately, the Italians also love English and American music, so there is a lot of that too. On the subject of music, I have finally finished typing out the lyrics for my next rock concert. They need to be in bold and size 18, no the font size silly, so that I can see it without my glasses at night. Whilst mentioning this, if you are not already on my invite list and can make it to Tuscany on June 20, do send your email address to june.finnigan@virgin.net. 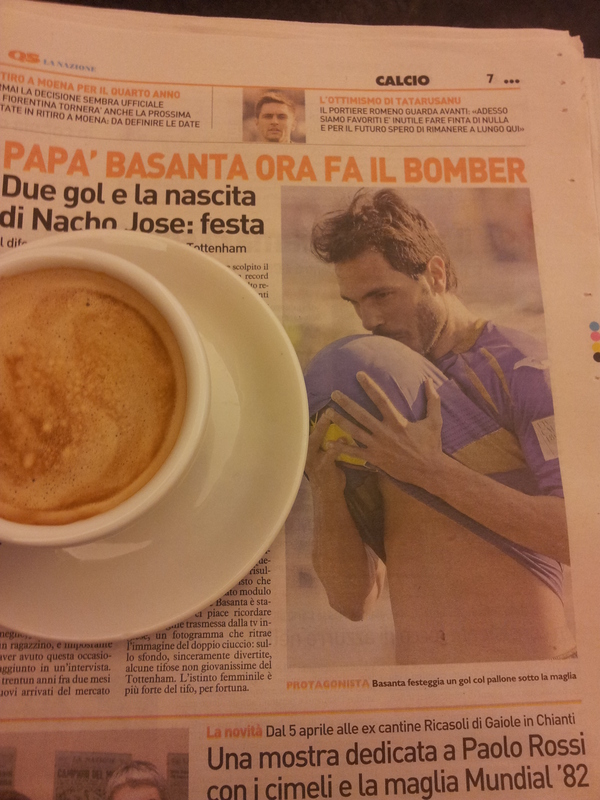 No doubt you are aware that the football (calcio) season is in full swing and the Italians are crazy for it. In our area the main team to follow is Florence (Fiorentina) whose colour is purple. I wear this colour a lot, because I like it and it suits me. I am often being congratulated for supporting the team! Ireland demolish Italy in the first round of the Six Nations. From our point of view, we are a great rugby family, coverage of the Six Nations Rugby last weekend, by the Italian sports channel, was a very pleasant surprise. As you can imagine, my man was a very happy rabbit indeed. Our grandson, who started at an English boarding school last term, for the sole purpose of following his dream of becoming a professional player, is also delighted to be able to watch it here in Italy during his half term. Sadly, Italy has a long way to go to be up to the standard of the other five teams, but time will tell. 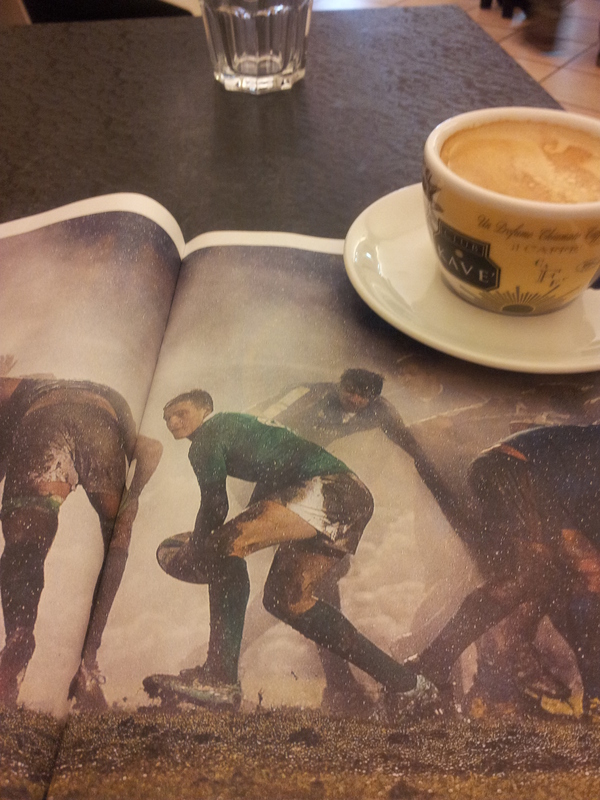 A big investment is needed in Italian Rugby for it to really become competitive. But life eeez good here in our lovely bit of the Chianti hills. Farty Barty the cat seems to have returned to normal after a rush of dating, as is his wont this time of year. I heard a Hoopee calling yesterday, the sun is now shining and by next weekend both my current novels should be ready for publication. Well, time to get on with making myself beautiful as my man and I are off to C’era una Volta for lunch. Thanks again for the follow and do drop me a line.